I would like to male a strip log section of several deviated wells that originate from the same surface/ collar location. The purpose is to correlate reservoir units and structural elevations. I can make a 3D strip log but I would prefer a simple 2D strip log with each well shown with an arbitrary separation from the next. When I try to select wells by collar location on the 2D Strip log Section Selection Map I can only select one of the three wells. Any ideas on how I can get over this without changing the surface locations? You might have better luck seeing the deviated wells using the 2D Striplog Profile program. This one will better display your vertical inclined or deviated boreholes. The Section tool will not display any deviated information. 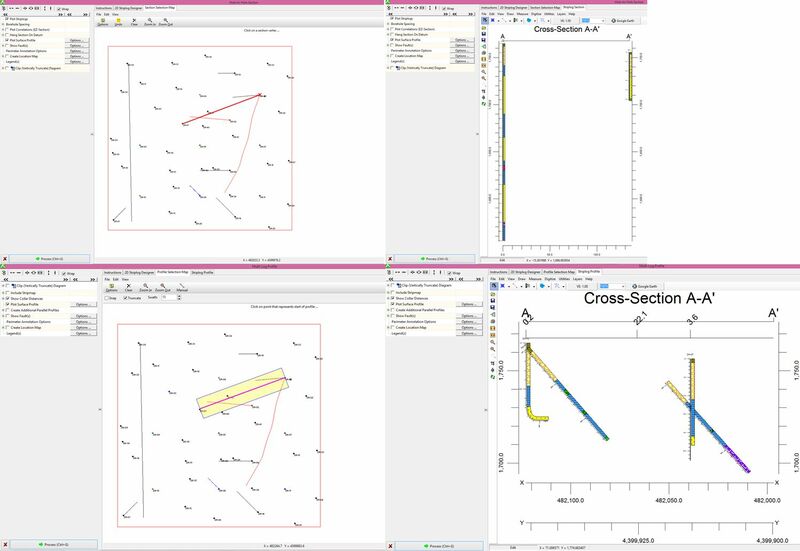 Below is an example from a modified version of the Sample project of making a section from a location with two deviated wells to a location with a vertical well, and a profile with the same track. When I used the 2D Striplog profile option I was able to see each of the deviated wells but...they were displayed with the deviation! I would like to display the deviated wells on a cross section as individual vertical striplogs (i.e. on a TVD scale) - like your first cross section above rather than the second. Any other ideas? I have had a similar problem plotting vertical striplogs of deviated Wells. One work around is to set the azimuth to zero and let the view angle of the 2D log be zero. That will put your striplogs in TVD (you'll need to insert a vertical scale in your 2D log to see this because all of the contact depth will still be displayed in MD if you have them turned on). So that you don't loose your directional data you can save it as a an .rwdat file. Then you could display your vertical logs as above. One thing you could probably try is change the X and Y of the holes with the same location to something slightly different, say 0.1 off. Then you can zoom in to select the one you want. Alternatively, you can make separate striplogs and append them in ReportWorks, but this may be a bit more time consuming to do. The fact that the sections plot logs as vertical is great, however that should be done with the true vertical depth of deviated Wells rather than the measured depth so that it coincides with the elevation scales. Regarding the issue of wells starting from the same location: I used Brian's suggestion once, that works fine. Though it can be tedious in case you have a lot of boreholes, to zoom in to the selection map. Would providing a drop down list for boreholes to show in section view be an option for that? E.g. when the user chooses to visualize bore holes with uniform borehole spacing. I'll bring this up at the next development meeting and see if we can work on a solution for this. Maybe it will appear in a future update.